Despite rain delays in some areas, Saskatchewan producers now have nine per cent of the 2016 crop combined, according to Saskatchewan Agriculture’s Weekly Crop Report. This is slightly ahead of the five-year (2011-2015) average of eight per cent for this time of year. Twenty-one per cent of the crop is swathed or ready to straight-cut. Regionally, producers in the southeast are the furthest advanced with 19 per cent of the crop in the bin. Twelve per cent of the crop is combined in the southwest, six per cent in the east-central region, four per cent in the west-central region and three per cent in both the northeast and the northwest. 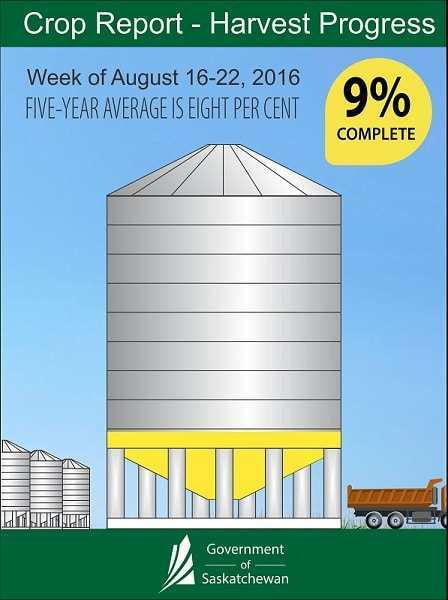 Eighty-three per cent of winter wheat, 20 per cent of fall rye, 41 per cent of field peas, 21 per cent of lentils, 10 per cent of barley, five per cent of mustard, four per cent of spring wheat, three per cent of durum and two per cent of canola have been combined. Thirty per cent of canola and 12 per cent of mustard have been swathed. Scattered rain showers fell across the province, with some areas in the northwest such as Meadow Lake receiving 119 mm. However, the majority of the province received little to no rain. Provincially, cropland topsoil moisture is rated as 18 per cent surplus, 78 per cent adequate and four per cent short. Hay land and pasture topsoil moisture is rated as five per cent surplus, 85 per cent adequate, nine per cent short and one per cent very short. The majority of crop damage this past week was caused by excess moisture, strong winds, lodging and diseases such as fusarium head blight, sclerotinia and mould. Many fields remain soft and field access will be an issue in some areas. Producers are busy harvesting and haying.